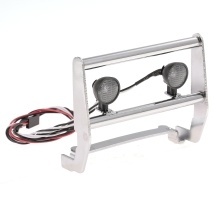 This Metal bumper includes 2LED lights, just make you pay less but get more. It provides car body protection and extra bright lighting for mastering tough trails. Installation couldn&apos;t have been any easier, it suitable for Traxxas, TRX4, Bronco, 82046-4 car. Good choice for you. Be made of metal material, strong and durable. Comes with LED lights, just make you pay less but get more. No worry about installation, install easier, good for car enthusiast. Novel appearance and exquisite workmanship. If you have any problem, please feel free to contact with us without hesitation.